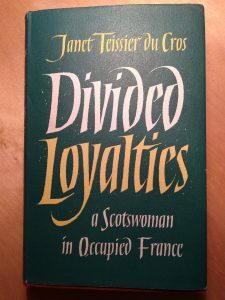 One of my Christmas presents was a memoir, ‘Divided Loyalties – a Scotswoman in occupied France’ by Janet Teissier du Cros. It was written by an Edinburgh-born woman who married a Frenchman and spent the years of the Second World War in the Cévennes region of France during the German occupation. In her Edinburgh years, the author was a talented young pianist who studied with Donald Tovey, then professor of music at Edinburgh University. Tovey is now remembered mainly for his essays on musical analysis, but he considered himself a practising musician first and foremost. In fact, many of his essays started life as programme notes for concerts which he himself conducted. He was also a composer and a fine pianist who played recitals with many leading international performers (Casals, Jelly d’Aranyi) when they visited Edinburgh. ‘To say that he unwittingly bewitched me with his playing, as Othello bewitched Desdemona with his story-telling, would be an understatement. It was something even beyond that. I believe that no-one who heard Tovey play when he was at the height of his powers will ever forget the experience, or cease to feel that there was something there which no other pianist possessed. Not only had he the great executant’s powers; he understood the whole genesis of what he was playing, it spoke to him in the language he best understood and initiated him into the composer’s inmost thoughts, those he could never express in words. ‘Both his understanding – not the cerebral appreciation of the musicologist, but the re-creation of a fellow artist – and his emotion were things he succeeded in transmitting more directly than any other player I ever heard. For as long as he played he made you a person far superior to what in fact you were, and the language became intelligible to you too, which before had simply been intoxicating sound. This entry was posted on Friday 11th January 2019 at 4:53pm	and is filed under Books, Inspirations. You can leave a response, or trackback from your own site. Now I understand better what a pianist friend meant when talking about her own teacher being ‘of the Tovey School of Playing’!